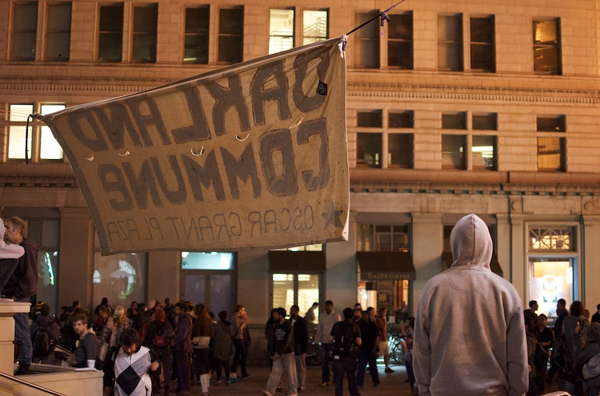 An overview on the rise and decline of Occupy Oakland. 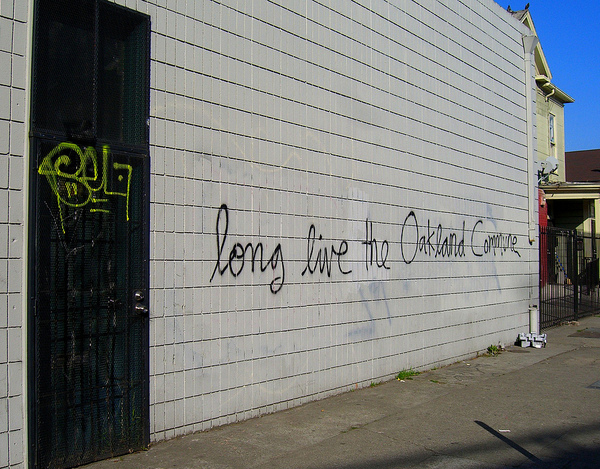 In their repeated attacks on Occupy Oakland, the local decolonize tendency is in some ways correct.1 Occupy Wall Street and the movement of the 99% become very problematic when applied to a city such as Oakland and reek of white liberal politics imposed from afar on a diverse population already living under brutal police occupation. What our decolonizing comrades fail to grasp (intentionally or not) is that the rebellion which unfolded in front of City Hall in Oscar Grant Plaza does not trace its roots back to September 17, 2011 when thousands of 99%ers marched through Wall Street and set up camp in Lower Manhattan. 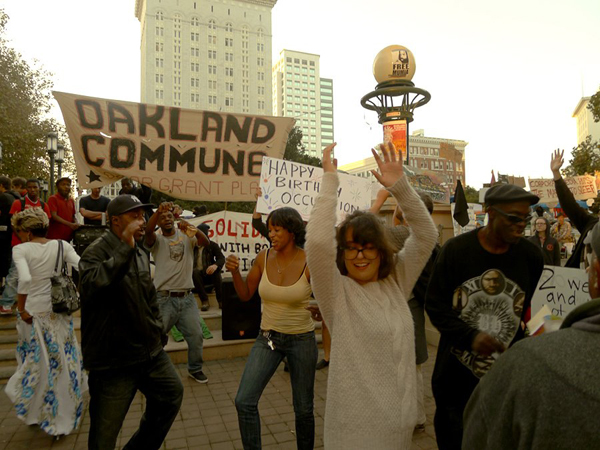 The Oakland Commune was born much earlier on January 7, 2009 when those youngsters climbed on top of an OPD cruiser and started kicking in the windshield to the cheers of the crowd. Thus the name of the Commune’s temporarily reclaimed space where anti-capitalist processes of decolonization were unleashed: Oscar Grant Plaza. All of the large social movements in this country following the anti-globalization period have heated up quickly, bringing in millions before being crushed or co-opted equally as quickly. The anti-war movement brought millions out in mass marches in the months before bombs began falling over Baghdad but was quickly co-opted into an “Anybody but Bush” campaign just in time for the 2004 election cycle. The immigrant rights movement exploded during the spring of 2006, successfully stopping the repressive and racist HR4437 legislation by organizing the largest protest in US history (and arguably the closest thing we have ever seen to a nation-wide general strike) on May 1 of that year 2. The movement was quickly scared off the streets by a brutal wave of ICE raids and deportations that continue to this day. 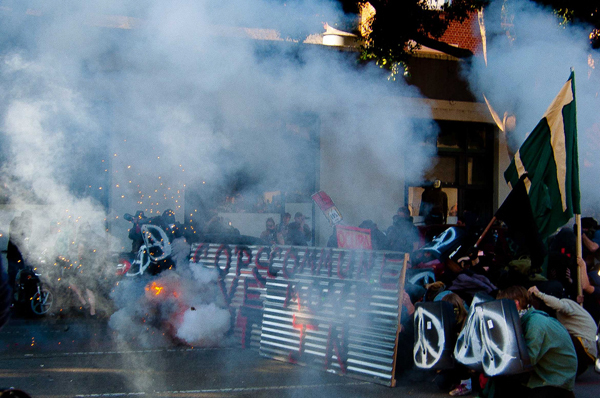 Closer to home, the anti-austerity movement that swept through California campuses in late 2009 escalated rapidly during the fall through combative building occupations across the state. But by March 4, 2010, the movement had been successfully split apart by repressing the militant tendencies and trapping the more moderate ones in an impotent campaign to lobby elected officials in Sacramento. Such is the rapid cycle of mobilization and decomposition for social movements in late capitalist America. 2. The demonstrations on May 1, 2006, called El Gran Paro Estadounidense or The Great American Boycott, were the climax of a nationwide series of mobilizations that had begun two months earlier with large marches in Chicago and Los Angeles as well as spontaneous high school walkouts in California and beyond. Millions took to the streets across the country that May 1, with an estimated two million marching in Los Angeles alone. Entire business districts in immigrant neighborhoods or where immigrants made up the majority of workers shut down for the day in what some called “A Day Without an Immigrant”. This article sort of started a shitstorm...or rather a response to it did. 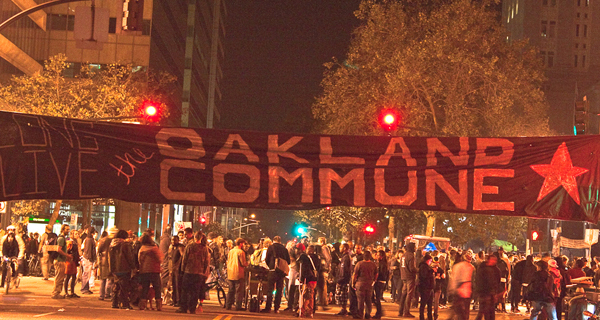 Who is the Occupy Oakland Media Collective? The whole Boots and anarchists debate also sorta gave some pre-text to this stuff. It's been dead for quite some time, but these latest acts of self-destruction are the final nails in the coffin. And the pig repression is being stepped up; nearly every arrest scenario results in multiple felonies -- and this is occurring on both sides of the Bay. It's also important to recognize that the implosion of the shredded remnants of Occupy Oakland don't require any police or state-sponsored assistance. The shrill invocation of COINTELPRO is just a desperate attempt to recapture an illusory unity that never actually existed; anti-radical factions existed from the beginning, and the incoherent "99%" nonsense made it easier for them to undercut the self-organized confrontations with capitalism.